POSTCARD♯10: Delhi: Going to visit my neighbour who says she can help me with a new sim card for the iPhone5. I got the phone in the UK, and need a Nano SIM for India, the tiny one, rather than the standard size for the Nokia I had before. 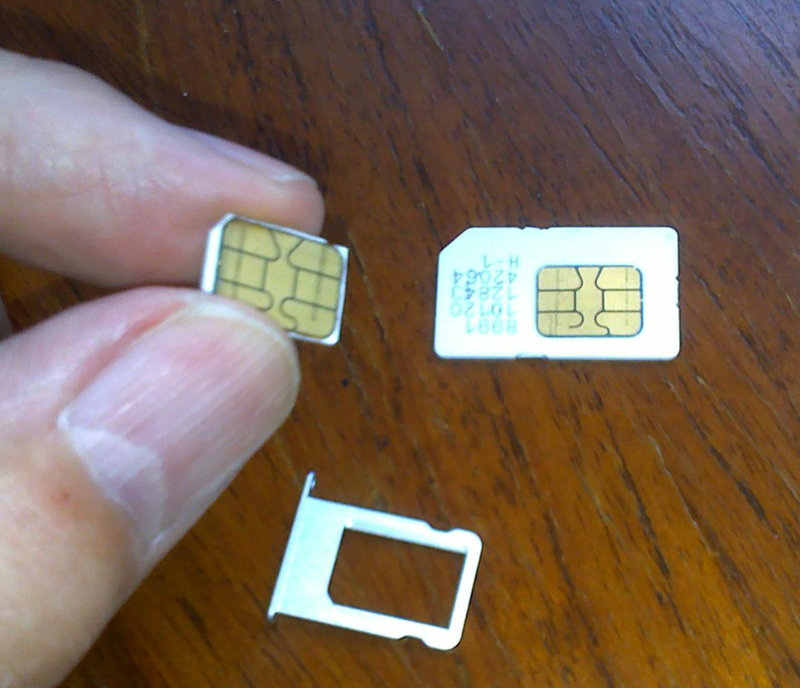 When I was in London, I had to wait 24 hours for this new NanoSIM(4FF) to be activated – why? I don’t know. Difficult to be without your contacts for that long. But that’s how it is there, no flexibility – in other countries there’s less control. In Bangkok, for example, I needed a Thai NanoSIM for the local network and was thinking it would be the 24 hour waiting thing again but they looked at the screen, clicked a couple of times, went in the back of the shop and came out with the new NanoSIM(4FF). Removed it from the backing card and put it in… working! Now in Delhi, I need a local SIM and I heard that if you take it to the phone shop and pay Rs.100/- (US$ 1.55) they have a special cutter and it’s done immediately, snip… you’re connected. My neighbour says you can just cut the old SIM with a knife, save the Rs.100/- and it’s better than going downtown in the heat and traffic. I’m hesitating, decide to Google it first. You’re supposed to do a bit of measuring and create a paper template to cut around carefully and then finish off with a piece of sandpaper. Well, my neighbour has a blade, saying, it’s not very sharp but let’s see; I think it’ll do. I watch as she starts to cut the sim; doing it by eye, no measuring, she has to hack at it a bit with the blunt cutter and finishes off with the kitchen scissors – cut off the little corner bit. Yes! Looks like the real thing. So try that… but it doesn’t fit into the slot in the phone! Why? Because she was thinking it was the MicroSIM(3FF) for the iPhone4 – that’s what she has and thought it’s what I had. But the NanoSIM(4FF) for the iPhone5 is smaller than that… oh-no, what to do now? Worry-worry. But no problem just cut off a bit more to get it to fit. It’s like you offer someone a piece of cake and they say, oh that’s a bit too much for me, can you make it a bit smaller please? No science required. I’m amazed that it’s possible to do this. How come I didn’t know about it? There’s a feeling that I’ve been making life unnecessarily difficult when, in fact, things are quite simple. Walking back to my place, and nobody pays any attention to me, except the gardeners and ordinary folk who stop and look at me as I pass; an anomaly in their world. It’s a direct gaze, gentle, curious: there goes one of these foreigners, look!… children laugh and run away. White adult male, a colourless being, transparent eyes – comes from a different planet. So far away from the actuality of the human experience, dependent on the employment contract that enables all the support mechanisms. Not much of an idea how to do anything except the job and outside of that, wash the car on Sunday, cut the grass, watch TV. I’m dependent on others who have the basic skills I don’t seem to have. Meanwhile, somewhere inside, there’s this feeling that all it needs is the intuitive leap… and I don’t know how it happens or why it’s like that, the solution just comes to me – like seeing the whole picture all of a sudden, and knowing what it is. Great Robert Graves quote … ! !